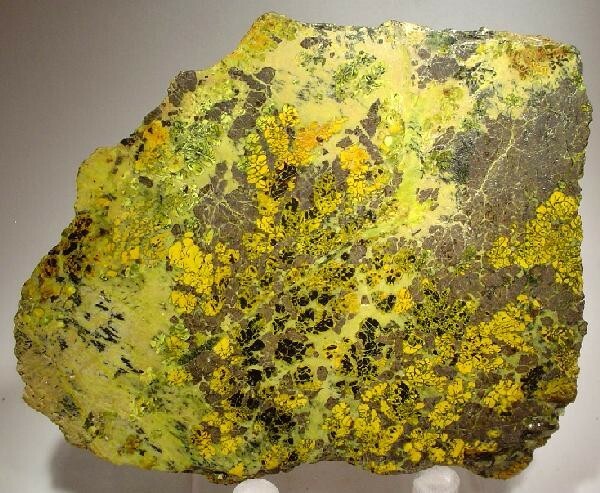 Gummite: Mineral information, data and localities. In allusion to the gum-like or rubber-like (rubber = gummi in German) appearance of some early material. 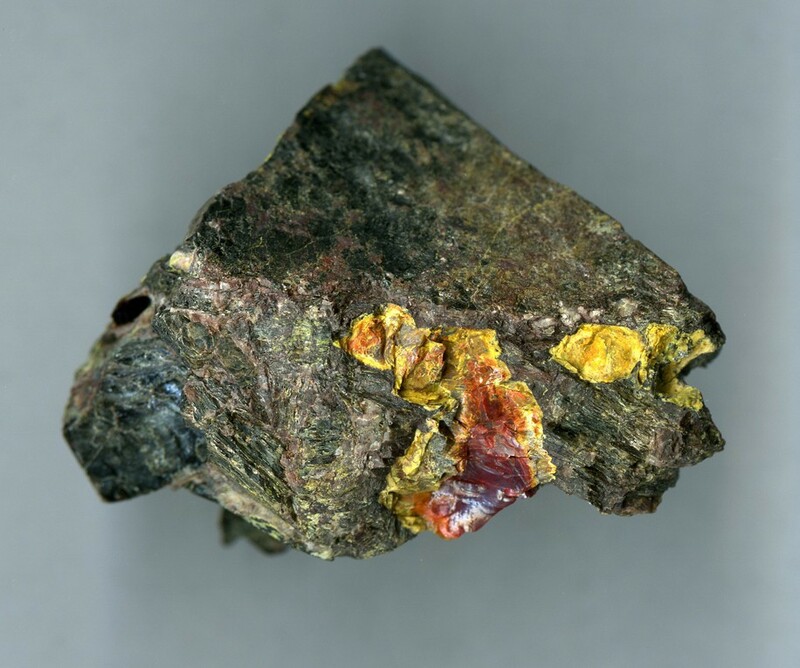 A mixture of uraninite and secondary uranium minerals of variable composition. Coracite Probably uraninite partly altered to gummite. Yttrogummite A yttrium (REE)-bearing variety of gummite. Contains relatively large amounts of the yttrium earths. A alteration product of yttrian uraninite. Uraninite 81 photos of Gummite associated with Uraninite on mindat.org. Uranophane 21 photos of Gummite associated with Uranophane on mindat.org. Autunite 16 photos of Gummite associated with Autunite on mindat.org. Cyrtolite 8 photos of Gummite associated with Cyrtolite on mindat.org. Zircon 6 photos of Gummite associated with Zircon on mindat.org. Curite 6 photos of Gummite associated with Curite on mindat.org. Fluorapatite 5 photos of Gummite associated with Fluorapatite on mindat.org. Clarkeite 4 photos of Gummite associated with Clarkeite on mindat.org. Meta-autunite 4 photos of Gummite associated with Meta-autunite on mindat.org. Pitchblende 4 photos of Gummite associated with Pitchblende on mindat.org. Breithaupt (1847): 903 (as urangummi). Palache, Charles, Harry Berman & Clifford Frondel (1944), The System of Mineralogy of James Dwight Dana and Edward Salisbury Dana Yale University 1837-1892, Volume I: Elements, Sulfides, Sulfosalts, Oxides. John Wiley and Sons, Inc., New York. 7th edition, revised and enlarged: 622-624. Frondel, C. (1956) The mineralogical composition of gummite. American Mineralogist: 41: 539-568. Victorio Angelelli (1958). Los Minerales de Uranio, sus Yacimientos y Prospección. Departamento de Geología y Minería. Comisión Nacional de Energía Atómica. Galliski, M. A. (1983). Distrito minero El Quemado, Deptos. La Poma y Cachi, provincia de Salta. II. Geología de sus pegmatitas. Rev. Asoc. Geol. Argentina, 38, 340-380. Victorio Angelelii (1958). Los minerales de Uranio sus yacimientos y prospección. Departamento de Geología y Minería. Comisión Nacional de Energía Atómica. Argentina. María Elena SAULNIER y Orqídea MORELLO. Comisión Nacional de Energía Atómica, morello@cnea.gov.ar. MINERAL DE U-Ta-Nb EN LOS GRANITOS SAN IGNACIO-CUMBRE DE LOS PINOS CATAMARCA-TUCUMAN. Giblin, A. (2005). Alligator Rivers uranium deposits (Koongarra, Narbarlek and Ranger One), Northern Territory. Regolith Expression of Australian Ore Systems. CRC LEME, Perth, 411, 414. South Australian Museum collections / Parkin, L; 1957; The Myponga Uranium project, SA Mineral Review,103, pp. 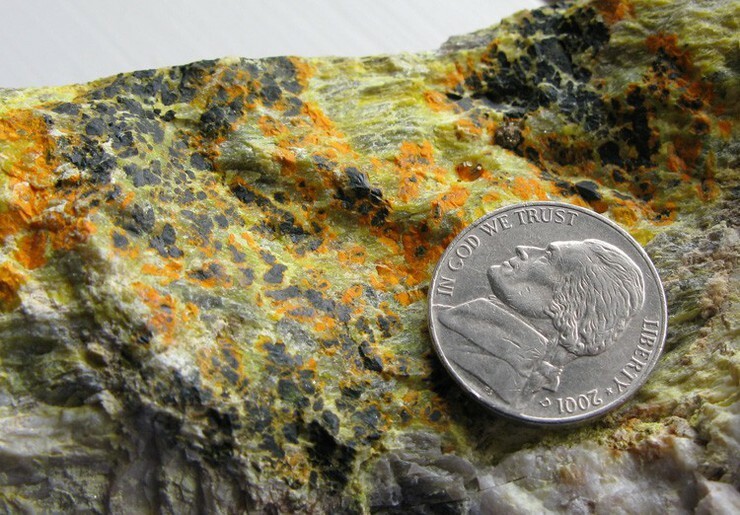 46-53; American Mineralogist: 46: 12-25. 1983, Noble, RJ, Just, J & Johnson J, Catalogue of South Australian Minerals - 1983. Ng, R., Alexandre, P., & Kyser, K. (2013). Mineralogical and geochemical evolution of the unconformity-related McArthur River Zone 4 orebody in the Athabasca Basin, Canada: implications of a silicified zone. Economic Geology, 108(7), 1657-1689. Yang, D. S., Zhang, Y. T., Tu, X. L., Pang, B. C., & Chen, Y. F. (2017). A new genetic interpretation for the Caotaobei uranium deposit associated with the shoshonitic volcanic rocks in the Hecaokeng ore field, southern Jiangxi, China. Solid Earth Sciences, 2(1), 23-40. Viktor Goliáš, Gereltsetseg Tumurkhuu, Pavel Kohn, Ondřej Šálek, Jakub Plášil, Radek Škoda, Jan Soumar (2016): Construction of new houses on a uranium vein outcrop: a case study from the Czech Republic. Nukleonika 61(3), 343-349. Tilak, V. V. S. S., & Aswathanarayana, U. (1963, January). Geochemical studies in the uranium prospect at Umra, Rajasthan. In Proceedings of the Indian Academy of Sciences-Section A (Vol. 57, No. 1, pp. 34-43). Springer India. Ravagnani D. (1974): I giacimenti uraniferi italiani e i loro minerali. Gruppo Mineralogico Lombardo - Museo Civico di Storia Naturale Ed., Milano, 188 pp. Ravagnani, D. (1974): I Giacimenti uraniferi italiani e i loro minerali. Gruppo Mineralogico Lombardo - Museo Civico di Storia Naturale, Ed., Milano, 188 pp. Maglia, L. (1972): Il giacimento uranifero di Bric Colmè. Notizie Gr. Mineral. Lombardo, 3, 3 (sett. 1984), 66-71; Ravagnani, D. (1974): I giacimenti uraniferi italiani e i loro minerali. Gruppo Mineralogico Lombardo - Museo Civico di Storia Naturale, Ed., Milano, 188 pp. Cohen, N.E., Brooks, R.R., Reeves, R.D. (1967) The occurrence of beryllium in the Hawks Crag Breccia of the Lower Buller Gorge region of New Zealand. New Zealand Journal of Geology and Geophysics, 10:3, 732-741.
field collected by Knut Eldjarn, visually identified. Larsen, A.O., Škoda, R., Åsheim, A. (2016): Yttrian epidote and allanite-(Y) from a granite pegmatite in Bamble, Telemark, Norway. Norsk mineralsymposium 2016, 33-38. Banaś 1970: Wstępne dane o minerałach uranu strefy Kopańca. Spraw. z Pos. Kom. Nauk PAN Oddz. w Krakowie T. 13/1; Mochnacka, K., Oberc-Dziedzic, T., Mayer, W., & Pieczka, A. (2015). Ore mineralization related to geological evolution of the Karkonosze–Izera Massif (the Sudetes, Poland)—Towards a model. Ore Geology Reviews, 64, 215-238. Baldwin, J. R. (1994). Lithium and tantalum mineralization in rare-element pegmatites from southern Africa (Doctoral dissertation, University of St Andrews). De Quervain, F. (1965) Uraninit führender Turmalin-Sillimanitpegmatit aus dem Gotthardmassiv. Vierteljahrsschrift der Naturforschenden Gesellschaft in Zürich, 110, 395-400. Anthony, J.W., et al (1995), Mineralogy of Arizona, 3rd.ed. : 241; Galbraith, F.W. & D.J. Brennan (1959), Minerals of AZ: 35. Anthony, J.W., et al (1995), Mineralogy of Arizona, 3rd.ed. : 241, 399; Robinson, R.L. (1955), Linda Lee claims, Pima Co., AZ, US Atomic Energy Comm. Prelim. Reconn. Rept. A-P-331. ⓘ Radiation prospect (Radiation property; Embree property) ? Walker, G.W., Lovering, T.G., and Stephens, H.G. (1956), Radioactive Deposits in California: Special Report 49 of the Californnia Division of Mines & Geology: 31; Troxel, Bennie Wyatt & P.K. Morton (1962), Mines and mineral resources of Kern County, California: California Division Mines & Geology County Report No. 1, 370 pp. : 335; Murdoch, Joseph & Robert W. Webb (1966), Minerals of California, Centennial Volume (1866-1966): California Division Mines & Geology Bulletin 189: 209, 378. MacKevett, Edward Malcolm, Jr. (1960), Geology and ore deposits of the Kern River uranium area, California: USGS Bulletin 1087-F: 211; Murdoch, Joseph & Robert W. Webb (1966), Minerals of California, Centennial Volume (1866-1966): California Division Mines & Geology Bulletin 189: 209. Anonymous (1954), California Division of Mines, Mineral Information Service: 7(Dec 54): 2, 18; Murdoch, Joseph & Robert W. Webb (1966), Minerals of California, Centennial Volume (1866-1966): California Division Mines & Geology Bulletin 189: 209.
ⓘ Rosamond Uranium prospect (Rosamond prospect; Rosamond-Mojave prospect) ? Walker, G.W., et al (1956), Radioactive deposits in California: California Division Mines Special Report 49: 15; Murdoch, Joseph & Robert W. Webb (1966), Minerals of California, Centennial Volume (1866-1966): California Division Mines & Geology Bulletin 189: 209. Walker, G.W., Lovering, T.G., and Stephens, H.G. (1956), Radioactive Deposits in California: Special Report 49 of the Californnia Division of Mines & Geology: 15; Pemberton, H. Earl (1983), Minerals of California; Van Nostrand Reinholt Press: 329.
ⓘ Buster Tom prospect (Buster Tom claim) ? Walker, G.W., Lovering, T.G., and Stephens, H.G. (1956), Radioactive Deposits in California: Special Report 49 of the Californnia Division of Mines & Geology: 17; Murdoch, Joseph & Robert W. Webb (1966), Minerals of California, Centennial Volume (1866-1966): California Division Mines & Geology Bulletin 189: 209. Murdoch, Joseph & Robert W. Webb (1966), Minerals of California, Centennial Volume (1866-1966): California Division Mines & Geology Bulletin 189: 209. Meeves, H., et al (1966), Reconnaissance of beryllium-bearing pegmatite deposits in six western states, US Bur. Mines Info. Circ. 8298: 30 (Table A-1). ⓘ Fillow Quarry (Branchville Quarry; Branchville Mica Mine; Smith Mine) ? Ingerson, Earl. (1938): Uraninite And Associated Minerals From Haddam Neck, Connecticut. American Mineralogist: 23 (4): 269-276.; Schooner, Richard. (circa 1980s), Untitled manuscript on central Connecticut mineralogy. Schooner, Richard. (1947): Collins Hill (Portland, Conn.) Deserted. Rocks & Minerals, vol. 22, no. 2, p. 135.
ⓘ Amphlett Mica Mine (Franklin Mine) ? King & Foord, 1994. Mineralogy of Maine, Vol. 1., p.178. ; Cameron, Eugene N.; and others (1954) Pegmatite investigations, 1942-45, in New England. USGS Professional Paper 255. Emerson, B.K. Geology of Massachusetts and Rhode Island, 1917. (USGS Bulletin 597), p.216-217. ⓘ Rollstone Hill Quarry ? Travis Olds collection; Robinson, G.W., and Carlson, S.M., (2013) Mineralogy of Michigan Update: published online by A.E. Seaman Mineral Museum, Houghton, MI, 46p. Rocks & Min. : 15: 124. Rocks & Min. : 16:208-211.; USGS Prof Paper 255; USGS Prof Paper 353; Korzeb, Stanley L., Foord, Eugene E., and Lichte, Frederick E. (1997) The chemical evolution and paragenesis of uranium minerals from the Ruggles and Palermo granitic pegmatites, New Hampshire. Canadian Mineralogist, 35, 135-144. Meyers & Stewart 1956. Geology of NH, Part III. The Iron Mines of NJ (1910), Bayley:325-327. Minerals of New Mexico 3rd ed. ; Jahns, R. H., (1946) Mica Deposits of the Petaca District, Rio Arriba County, New Mexico, with Brief Descriptions of the Ojo Caliente District, Rio Arriba County, and the Elk Mountain District, San Miguel County. NMBMGR Bulletin 25. Rocks & Min. :11:77; 16:290 & 60:92.; Ross, Henderson, and Posnjak (1931), American Mineralogist: 16: 213. Crook, Wilson W. III (1977) The Clear Creek pegmatite: a rare earth pegmatite in Burnett County, Texas. Mineralogical Record, 8 (2): 88-90. Self-collected by David Aldridge, March, 2006.